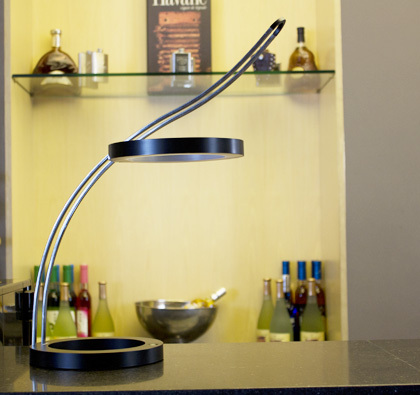 Magic lamp is a design jump out of the traditional lamp. It used high performance magnets components in the lamp head as the core design, the lamp head can slide along the rails. It flies free like a magical aura. 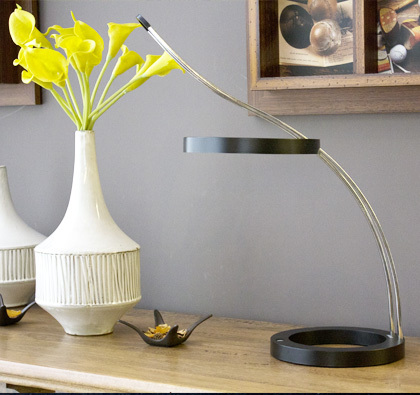 Can be placed at any position you want, formed directly or reflection illumination, act as table lamp or ambiance lighting. Magic lamp adopts the high-performance LED chips, high efficiency illumination more than 1000Lux (40cm height from table), can provides illumination for cartographic work. The lamp head designed as 19cm diameter ring shape can be uniformly illuminated 1.5 meter area from 40cm height desktop, which its edge illumination decreased to 100Lux. Comfortable light in warm white color temperature (4500K), ensure the user fell good and protect their eyes. White color LED light-emitting chromatography in the visible range, excluding infrared and ultraviolet ray, no radiation damage to human skin. Energy-saving design with high efficiency components only in 9W power, compare with 60W incandescent lamp, it is 85% of energy saving. The Lamp have high reductive color LED chips (Ra>82), under the lamp, picture and goods with brightly true color. At the same time, the optimization design of light shade, avoid direct light point-blank eye. LED Lamp works in the low voltage DC state, not like fluorescent lamp flicker frequency.